A food of sacred origin, is too often consumed mindlessly in the modern world. Nutritionally superior to almost all foods touted for antioxidants, the indiscriminate and over consumption of chocolate counterproductively undermines health. Deep Tasting: A Chocolate Lover's Guide to Meditation introduces the method of Chocolate Tasting Meditation™ or CTM™ . Chocolate, consumed mindfully, can improve our ability to taste and appreciate better quality, artisan chocolates. Supporting artisan, or craft, chocolate promotes sustainable agriculture, protects rainforests, the working conditions and livelihoods of farmers, and economic justice. Learn Deep Tasting through the guided tasting meditations found on this website and Dr. Peluso's book, Deep Tasting: A Chocolate Lover's Guide to Meditation. This book can open the doors to the spiritual practice of more traditional meditation and to sacred activism for those who wish to make this world a better place. But if your goal is simply to become a more discerning consumer of chocolate, the Deep Tasting techniques you will learn here will place you on the path to fully appreciate the world's finest, most highly rated chocolates as featured in Rev. 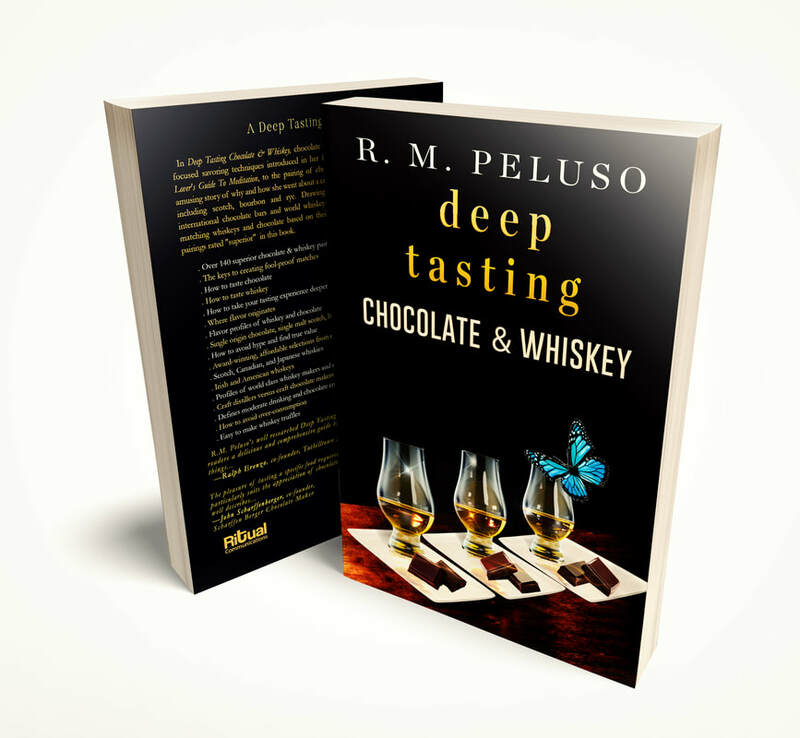 R. M. Peluso Riffs on Chocolate blog, New Chocolate Tasting Meditations blog and the C-spot.com where Dr. Peluso has served as a reviewer since 2006.
to cacao and chocolate through mindful consumption. A thoroughly researched and analytical approach to finding the harmonies in two gustatory luxuries–whisky and chocolate. By deconstructing and detailing the essences of the two, R. M. Peluso explains how and why their similar and contrasting flavors can work in synergy to achieve some dazzling pairings. Read more reviews in the book! ​ Available on Amazon, Barnes and Noble, and iTunes now! ...A unique and fascinating guide to the taste, aroma, and even the making of fine artisanal chocolate...all chocolate lovers will learn much from this delightful and instructive read. Highly recommended! ...For those who practice meditation or are exploring it, her chocolate meditation exercises will be a real treat...I think anyone who loves chocolate will find this an enlightening and enjoyable read. ...I started using chocolate, consciously, as a tool to focus my attention during my meditation...it allowed me to calm my mind, and filter out distractions, faster than when not using it. Chocolate is going to be part of my regular meditation routine from now on! Deep Tasting. Indulge and Lose Weight. ﻿﻿﻿﻿﻿﻿﻿Blog featuring exciting new audio guided tastings to accompany featured artisan chocolates and through link﻿﻿s to﻿ the world's best artisan chocolate makers. Blog featuring RM's unique, and sometimes outrageous, improvised takes on products, events and issues in the chocolate world, played with nose for quality, authenticity, ethics and justice. Rev. R. M. for your conference or fund raiser!